This is how we say, "Welcome home." Be at home with the 21-in (533 mm) premium seat. Become nimble, thanks to models with four-wheel steering and four-wheel drive. The heavy-duty transmission, sturdy frame, and easy-to-use attachments can really dig in. The precision cut of the AccelDeep™ Mower Deck or High Capacity Mower Deck help you turn your yard into the perfect backdrop for family memories. Important advantages for superior mowing performance and equipment versatility. Power Flow™ material collection systems make lawn cleanup easy. 60-in. (152-cm) Edge™ High-Capacity (HC) Mower Deck is heavy duty. Engine is three-cylinder diesel for fuel economy and durability. Modern styling has functional design. Frame is full-length welded steel for strength. Hydraulic power steering gives effortless control. 48-in. (122-cm) Accel Deep™ (48A) Mower Deck cuts clean and is versatile. MulchControl™ for 48-in. (122-cm) Accel Deep™ (48A) and 54-in. (137-cm) and 60-in. (152-cm) High-Capacity (HC) Mower Decks is convenient to use. 54-in. 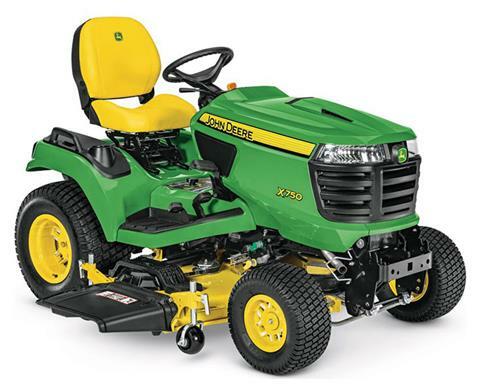 (137-cm) Edge™ High-Capacity (HC) Mower Deck is heavy duty.